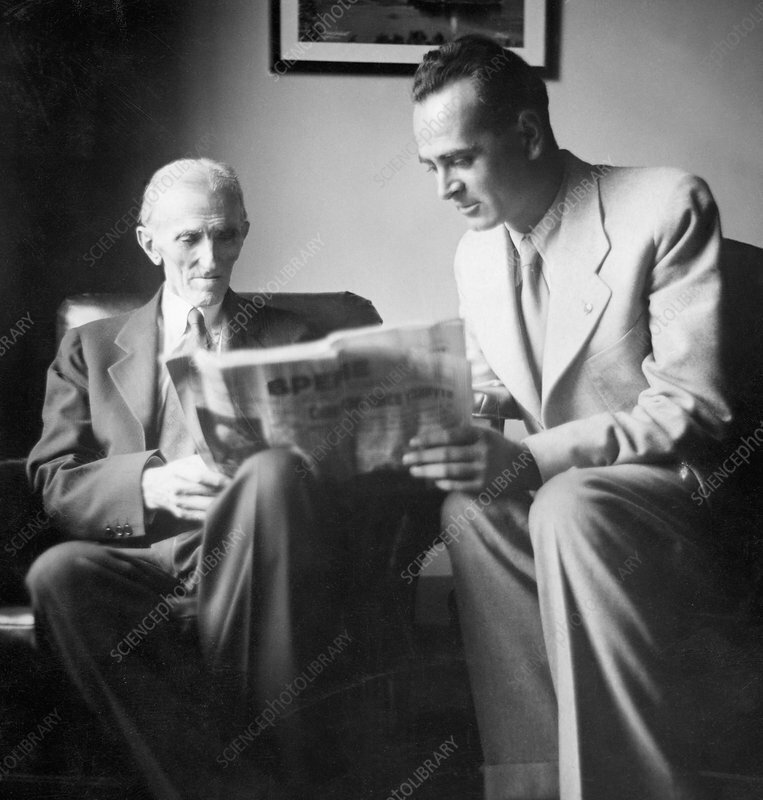 Nikola Tesla (1856-1943), Serb-US physicist and electrical engineer (left), in his eighties, in New York with the director of Yugoslav magazine 'Vreme'. Tesla was educated at Graz and Prague, but in 1884 he emigrated to the USA. He developed the alternating current (a.c.) induction motor, and helped advance a.c. power generation and transmission. He also worked on high-frequency a.c. currents, inventing the Tesla Coil, a transformer in which the primary and secondary coils are in resonance. He used it to create electric sparks 40 metres long, and in 1899 lit 200 electric lamps without wires. The SI unit of magnetic flux density is named for him. Photographed on 26 July 1938, for an interview for an article ('Telsa is Preparing New Discoveries'), published in 'Vreme' on 25 August 1938.